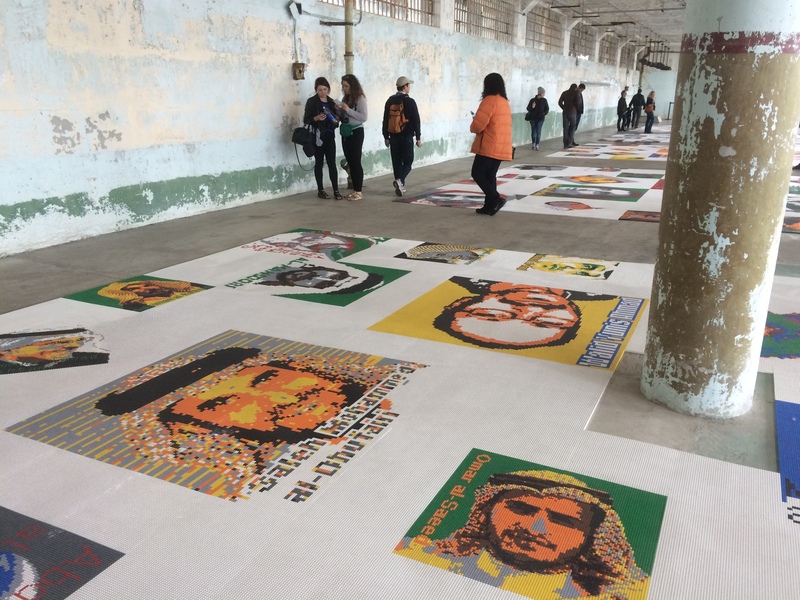 The exhibition of sound and visual art installations by the celebrated Chinese artist and dissident Ai Weiwei is coming to an end this Sunday after many months on display on Alcatraz Island. My visit to see @Large: Ai Weiwei on Alcatraz less than a week before its closing a couple of days ago got me wondering about the impact of the exhibition. After all, the artist was “handed” one of the world’s most famous prisons as a canvas for activism through art in the wake of his own internationally-decried incarceration for speaking out against the Chinese government. Alcatraz is one of the region’s biggest tourist attractions. And Alexandra Picavet, public relations specialist with Golden Gate National Recreation Area says @Large has brought even more people to Alcatraz. What the show does very palpably, especially through its largest installations, such as “Trace,” pictured here, is draw in-your-face attention to the subject of incarceration — specifically the fate of the many people around the world who’ve been locked up for asking difficult questions of divisive governments. 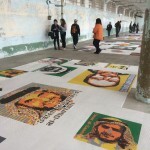 “Trace” unnervingly presents the portraits of around 175 prisoners of conscience on the floor of a giant prison work room through the playful and shiny medium of Legos. The Legos make the images look like pixelated, old-fashioned newsprint when viewed from a distance, reminding us just how forgotten, obscure and otherwise removed from our everyday lives most of these people are to a great many of us: Beyond a few faces like Edward Snowden’s, I was embarrassingly unfamiliar with most of the portraits. Visitors interact with the installations and then get the chance to write postcards to prisoners, which the exhibition staff then send off. The entrance ticket to the show pays, in part, for the mailing costs. One of the docents told me that more than 70,000 such postcards have been sent off to date. She also said 13 prisoners depicted in the show have been set free since September last year when it opened. Here is a list, provided by Resnicow + Associates, the PR firm that’s been handling media inquiries on the Ai Weiwei exhibition. Their list has 10 names on it, not 13. *Released to house arrest for three months. Following completion of house arrest, he will remain under supervised release for three years. *Released to halfway house as transition to home detention until full release in April 2015. Of course, it would be wrong to assume that these people have gotten out from behind bars because of the barrage of postcards from well-wishers writing from a far-off art show. The releases could have happened for any number of reasons. But it’s thrilling to think that Ai Weiwei’s vivid depictions of these individuals in @Large might have helped to bring about this positive denouement. But the postcard gambit hasn’t been unremittingly positive, apparently. The same docent explained that one prisoner from Vietnam represented in Ai Weiwei’s work had to be removed from the show because the deluge of postcards was actually threatening her safety. Apparently the prison authorities in Vietnam did not take kindly to the onslaught of support from abroad and her life was in danger as a result. I hope to add more information to this blog post, as well as double-check some of the facts, e.g about the number of POCs released, next week after the show closes. The PR firm that’s handling the show says that everyone at the For-Site Foundation, which organized the exhibition, is too busy to talk this week. After the closing day hooplah is over for the team, they will hopefully have time to chat with me in more depth about the outcomes. Ai Weiwei owns the works. Now that the show is done, the artist gas asked f0r the pieces to be shipped to Berlin. There’s currently no public information available regarding their fate from there. Gisel said the final postcard count is still being tallied. Also, check out this well-put-together roundup of the impact of the show in the Los Angeles Times.